The Eurasian group comprises a vast ensemble of lithospheric plates with many remarkable tectonic features. The most prominent of them all is undoubtedly the Himalayan-Alpine system, an incredibly long mountainous belt stretching more than 7000 km from the Strait of Gibraltar to Indonesia, formed by the closing of the Tethys Ocean in the Mesozoic (Yin and Harrison, 2000). Situated among this belt, the Himalayan-Tibetan orogeny started forming about 50 million years ago with the collision of the Indian subcontinent and the Eurasian plate and constitutes the region with the largest crustal thickness on Earth (Zhou and Murphy, 2005). The formation of the Himalaya and the Karakorum ranges is perhaps the best example of an orogeny triggered by continent-continent collision (Yin and Harrison, 2000). The relatively fast-moving Indian plate slowed down significantly as it came into contact with the Eurasian plate (Watson, 1999). The similarity in density between the two plates explains that most of the impact was absorbed by shortening of the crust, the dominant mechanisms at play being folding and thrusting of continental material (Hodges, 2000). These large deformations led to a shortening of about 1800 km between India and the Eurasian plate in the western part of this orogen, and more than 2750 km on the eastern side (Hodges, 2000). The uplift of the Tibetan plateau located to the north of the Himalayan range suggests that crustal shortening was not the only mechanism that occurred during impact of the two plates (Zhou and Murphy, 2005). A high-resolution tomographic model of the region seems to indicate a subhorizontal subduction of the Indian lithosphere occuring under the Himalayas and the Tibetan plateau (Zhou and Murphy, 2005). The Siberian Traps is the name given to the largest known flood basalt province on Earth. The event, which resulted in the rapid outpouring of millions of cubic kilometers of magma, coincides suspiciously well with the largest extinction in Earth's history, the Permian-Triassic extinction (Saunders et al., 2005). There have been many hypotheses that have attempted to explain the source of this massive outpouring, including a model of extension of the lithospheric layer coupled with a convective partial melting (Czamanske et al., 1998) and a mantle plume model (Saunders et al., 2005). The main site of eruption has been suggested to be located in the northern part of the West Siberian Basin due to uplift of the region and subsequent rifting (Saunders et al., 2005). 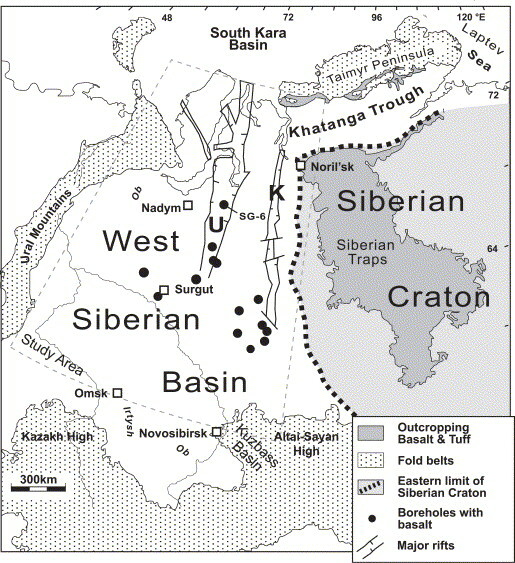 The outpourings progressed southward towards the Siberian Craton (Saunders et al., 2005). Several hot spots located in the Eurasian tectonic region are worth mentioning. The Reunion hotspot located in the Indian Ocean traces the past motion of the Indian subcontinent and was responsible for the Deccan Traps flood basalts of central India (Duncan et al., 1989) . The Iceland and the Azores hotspot are both located on the Mid-Atlantic Ridge between the Eurasian and the North American plates (Pilidou et al., 2004). They have been the subject of much debate concerning the source of their volcanism, the most popular being the mantle plume model. Czamanske, G. K., Gurevitch, A. B., Fedorenko, V. and Simonov, O.: Demise of the Siberian Plume: Paleogeographic and Paleotectonic Reconstruction from the Prevolcanic and Volcanic Record, North-Central Siberia, Int. Geol. Rev., 40(2), 95–115, 1998. Hodges, K. V.: Tectonics of the Himalaya and southern Tibet from two perspectives, Geol. Soc. Am. Bull., 112(3), 324–350, 2000. 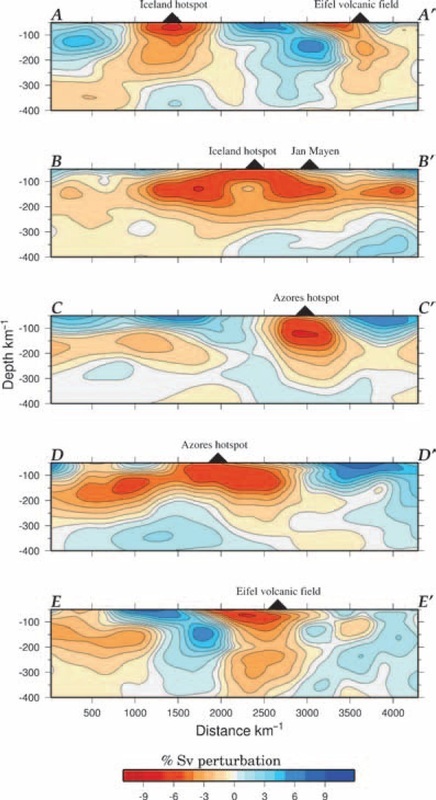 Pilidou, S., Priestley, K., Gudmundsson, Ó. and Debayle, E.: Upper mantle S-wave speed heterogeneity and anisotropy beneath the North Atlantic from regional surface wave tomography: the Iceland and Azores plumes, Geophys. J. Int., 159(3), 1057–1076, 2004.
http://pubs.usgs.gov/gip/dynamic/himalaya.html. The Himalayas: Two continents collide. Watson, J., May 1999. 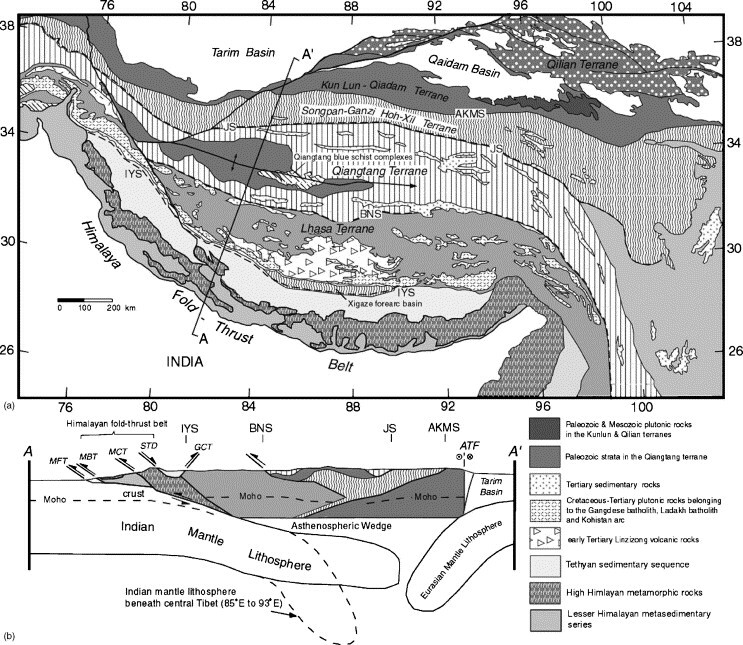 Saunders, A. D., England, R. W., Reichow, M. K. and White, R. V.: A mantle plume origin for the Siberian traps: uplift and extension in the West Siberian Basin, Russia, Lithos, 79(3–4), 407–424, 2005. Yin, A. and Harrison, T. M.: Geologic Evolution of the Himalayan-Tibetan Orogen, Annu. Rev. Earth Planet. Sci., 28(1), 211–280, 2000. Zhou, H. and Murphy, M. A.: Tomographic evidence for wholesale underthrusting of India beneath the entire Tibetan plateau, J. Asian Earth Sci., 25(3), 445–457, 2005.